Are you the fan of The Hobbit? How about one of free t-shirts? Well, have we got the giveaway for you if you answered yes to one or both of those questions. In fact, we're not just giving away 1 t-shirt. No, instead, we're giving away 9 to 9 different winners. If you're in the US, enter now for your chance. You have until 12/22 to enter to win. Good luck. 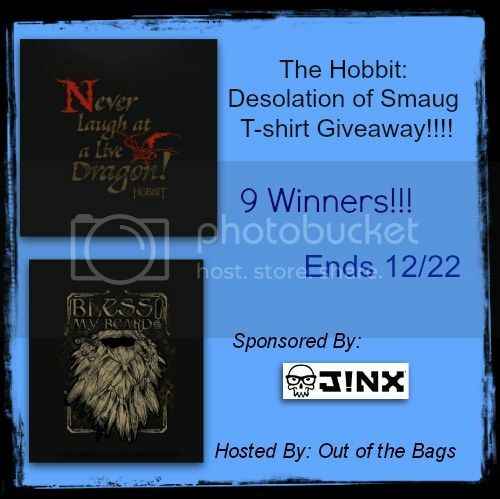 Hobbit: Desolation of Smaug T-Shirt. The Hobbit: Desolation of Smaug just hit theaters and what better way to celebrate than with an awesome t-shirt. J!nx has tons of awesome gear for the geeky gamers out there. They carry game and movie apparel including Portal, Diablo, Starcraft, Battlefield, Hobbit, World of Warcraft and more. Make sure you check out Out of the Bags' other J!inx Giveaway because 6 winners will win a World of Warcraft Kobold Hat. Giveaway open to US only!! 18+. Winners will have 24 hours to respond or another winner will be chosen. Giveaway Ends December 22rd at 11:59pm. Disclosure: Java John Z's is not responsible for prize fulfillment. My opinions are 100% my own and may differ from your own or even those stated in this post. Out of the Bags is responsible for prize delivery. I like the World of Warcraft Horde Crest Stencil Men's Tee. I like the Atari Pong Tee! Omg so many cool things on that site. Kids would love minecraft and portal. Hubby would love the hobbit. I like the J!NX 3D Skull Keychain. I like the Minecraft Creeper Premium +Zip-up Hoodie.